mundane jane: Come on. Take another little piece of my heart. Come on. Take another little piece of my heart. Earlier this week, my friend Heather carried some stuff to Goodwill and came home with more than she set out with. And that right there is reason enough to stick to the drive-through. I never go inside when I'm dropping off a donation. Also, though, I'm always the teeniest bit afraid that someone will say, "Hey, wait a minute. You can't leave that crap here." Heather lugged home an enormous bag of pieced quilt blocks that someone, somewhere decided weren't worth keeping. Really--who gives away quilt blocks? There's no answering that question about these particular blocks, but thinking about it prompted a lovely and lovingly written blog post about how Heather puts a part of herself into the things she makes, and how those parts will still be here long after she's sewn her last stitch. And she got that 100% right. I think that most of us who make things know this to be true. Inherent in that, though, is the idea that someone will remember us--or at least--the idea of us. "Here! Don't be chewing on that! My great-grandmother Heather Jane made that back when my meemaw was still a girl." It stands to reason that at least a few of the items that outlast us, though, will still be around long after the demise of everyone who ever knew us. When that time comes, Heather hopes someone will find those pieces of her heart on the thrift-store shelf and see them as treasure. And I am sure that someone will. A few years ago, I found a handcrafted clay dish at a junk store. The dish was small--something you might drop your rings into while washing up after supper. Or maybe it was meant to be an ashtray; people made such things, not so long ago. It was a homely little item, obviously made by a child--possibly while attending summer camp or vacation bible school. I turned it over and looked at the bottom. Its maker had written into the clay, "For Mommy. I love you." Which totally and completely broke my heart into little, teeny, tiny pieces. 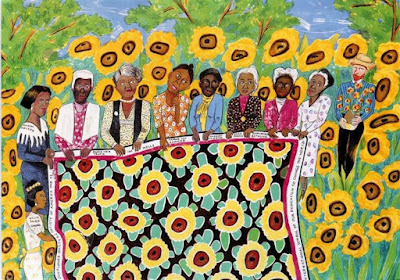 Image, Faith Ringgold Sunflower Quilting Bee at Arles, 1996. Thanks. I loved your story to match. I also love the Faith Ringgold you chose to go with this entry! We made pictures after her style in an elementary art class, and my piece ended up getting chosen to hang at the Arkansas Art Center. My parents now have it framed in our living room.